What tests can be done to find the cause of my migraines? Full question and answer. Are my migraines caused by fibromyalgia? Full question and answer. Sinus headaches or migraines when storms hit? Full question and answer. Co-worker gets migraines every day from my aftershave? Full question and answer. Is Dextrose a Migraine Trigger? Full question and answer. Best Pain Medication for Familial Hemiplegic Migraine? _Full question and answe_r. Naratriptan Safety and Botox Protocol for Migraine? Full question and answer. Medicine Like Bellergal for Migraine Prevention? Full question and answer. Migraines and Lowering Risk of Stroke and Cardiovascular Disease? Full question and answer. Spinal Tap for Migraine or Headache Diagnosis? Full question and answer. If you have a question, please go to _our submission form _. Accepted questions will be answered by publishing the answers here. Due to the number of questions submitted, no questions will be answered privately, and questions will be accepted only when submitted via the submission form. Dr. David Watson is a UCNS certified migraine and headache specialists and director of the Headache Center at West Virginia University. Je and Lead Health Guide Teri Robert, team up to answer your questions about headaches and Migraines. 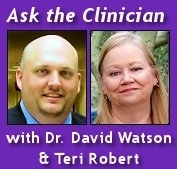 You can read more about _ Dr. Watson_ or more about _** Teri Robert** _. If you have a question, please click** HERE**. Accepted questions will be answered by publishing the answers here. Due to the number of questions submitted, no questions will be answered privately, and questions will be accepted only when submitted via ** THIS FORM**. Please do not submit questions via email, private message, or SharePost comments. Thank you.